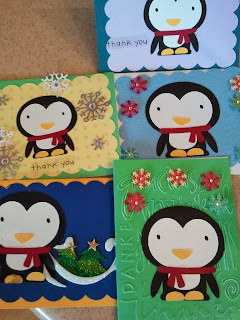 Megan's Cute Cards: Megan is on a penguin kick! Megan is on a penguin kick! Megan is enjoying making her thank you notes with penguins. Sometimes she embellishes with cuttlebug, other times with stickers- although I do not think any two thank you notes were the same. So many to thank, we have so much to be grateful for, most of all each other. God bless and happy new year to all.